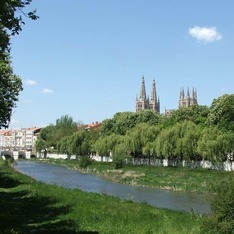 The walls of Burgos surrounded the city from at least the 13th-Century. These walls had different purposes: defensive and economic, but also of public order and health. The walls remained closed at night and served to control the entry and exit of the residents or to collect tributes. This door of San Juan is one of the preserved entrances of the city, as well as the Arco de San Martín, the door of the Jewish quarter, the Arco de Santa María, the Arco de San Gil and the Arco de San Esteban. The perimeter of the walls can be followed relatively easily. There are still well preserved remains, although from different periods, such as the Paseo de los Cubos, Parque del Castillo, or very close to the Arco de San Juan, next to Vena river, in front of the Public Library.